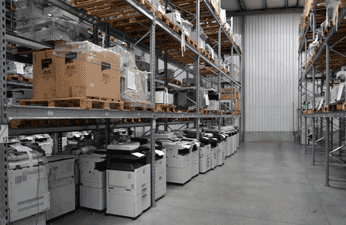 Reprodex is a leading company in the export of used copiers and copier equipment. With 27 years of experience we have been able to establish a strong network of customers in Asia, Africa, the Middle East and South America. It is our philosophy to build partnerships with suppliers and customers by creating strong, long term relationships based on confidence in word and service. Our machines, which are collected from all over Europe, but mainly from the Netherlands, Belgium, Germany and France, are stored at a central distribution centre near to Maastricht in the south of the Netherlands. This central European location facilitates the collection of machines from many of the leading distributors such as Ricoh, Xerox, Canon, Konica Minolta, Sharp, Hewlett-Packard, Kyocera Mita, Toshiba and Oce. 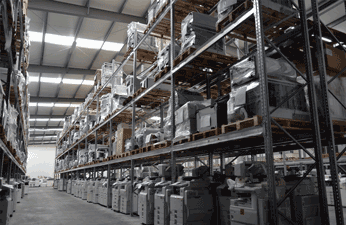 Our modern fully computerised warehouse comprises of 10,000 square metres in which over 6000 machines are stored. A very wide range of equipment is available and more than 3000 machines are exported each month. Annually over 40.000 machines pass through our warehouse on the way to their new owners. Upon arrival at our warehouse our machines are checked thouroughly for functionality and quality and thereafter registered into our digital stock system which enables us to trace the machines throughout our warehouse and to their final destination. The system provides our sales team with information such as copycount, options, accessories, condition and original serial number. Reprodex was founded in 1992 by Englishman David Ede who worked in the used copier export branch in the U.K for many years. Having brought the same concept to the Netherlands it soon became evident that the quality of the machines in the Netherlands and Germany was of an exceptionally high standard. Due to this Reprodex has been able to establish an excellent reputation in the used copier world for supplying good quality machines at competitive prices. The sales team now comprises David Ede, llona Janssen, Edmond Wintraecken, Michel Baten and Tim Maessen who all have years of experience working in this field. 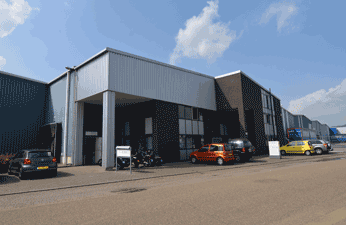 The warehouse is managed by Peter Goijen who has been in the business since 1997. We educate and train our employees to work in an environmentally responsible manner and aim to reduce consumption of resources wherever possible. We constantly seek to minimize harmfull emissions and pollutions wherever possible. Reprodex believes in protecting the environment. Within our activities we constantly work on prevention and limitation of environmental burden. We continuously keep trying to improve our environmental performance by reducing waste and energy consumption. We are an environmentally aware company commited to the 3R principles of Reduce, Recover and Recycle. All machines which enter our warehouse are thoroughly tested and must pass a copy before they are exported. Test copies are attached to each machine. WEEE legislation prevents electrical and electronic waste being exported, consequently Reprodex only sells machines which are in working condition. Our experienced technical team can repair minor problems. Machines which have irreparable technical problems will be transported by a certified waste transporter to Sims Recycling Solutions, market leader in the recycling of electrical and electronic waste. Reprodex receives certificates of destruction for all products which are being offered for recycling. Reprodex has set up an environmental management system in compliance with the ISO 14001 standard and we are proud to announce that as of March 2008 we are certified to this standard. Our warehouse comprises of 10.000 m2 of storage-space, and offers 3 loading bays for loading or unloading 3 containers or trucks simultaneously. Our warehouse team of 16 trained staff have years of experience in packing and loading orders. We can pack and load your machines per pallet, truck or container according to your specific requirements. As most of our machines are transported overseas we have great experience in loading containers. We can load 20ft and 40ft containers of stacked machines or with a double floor. Our warehouse team will calculate to maximize space utilisation and guarantee the safety of your precious goods. Amsterdam (Schiphol) 2 hrs. 30 min. Brussels Zaventem 1 hr. 15 min. Düsseldorf airport 1 hr. 15 min. Paris Charles de Gaulle 3 hrs. 30 min. Gronsveld is situated at the motorway junction of the E25/A2 (Amsterdam-Brussels) and A79 (Liège-Aachen/Cologne) and has good connections with all European highways. Reprodex is situated directly off the European highway E25/A2. Take the exit Gronsveld (56) and at the end turn right into Köbbesweg. After 103 meters turn left into Oosterbroekerweg. Cross the junction and after 300 meters turn left again into Veilingweg. Reprodex is located on your right side. Railway connections to Maastricht, check your time table through www.nshispeed.nl (2 hours) or www.maastrichtbrusselexpress.nl (1½ hours). We recommend flying to Brussels-Zaventem Airport. Flights from and to Cologne – Bonn airport: Amsterdam, Athens, Barcelona, Berlin, Dublin, Istanbul, Lisbon, London, Milan, Porto, Paris, Prague, Rome, etc. Railway connection to Maastricht (1 hour and 20 minutes to Aachen, then 1 hour and 10 minutes to Maastricht, total is 2 ½ hours. From London Waterloo you can book the train to Brussels (2 hours). In Brussels you change trains to Liege – Maastricht. Total journey time is about 4 hours. From Paris you can travel to Brussels ( 1 hour 20 minutes) or to Liège (3 hours).